Jack is officially four months old and every day is he looking less and less like a baby and more like a little boy... I'm trying to soak up every moment so I don't miss a thing! It just so happens that this past Sunday was the one year mark from when I found out I was pregnant with Jack, and it is so crazy to think how much has changed in just a year - I wouldn't trade it for anything! Jack turned four months old on Saturday, February 25th. According to his 4 month well-visit (which was yesterday), Jack weighs 18lbs and is 26 inches long. 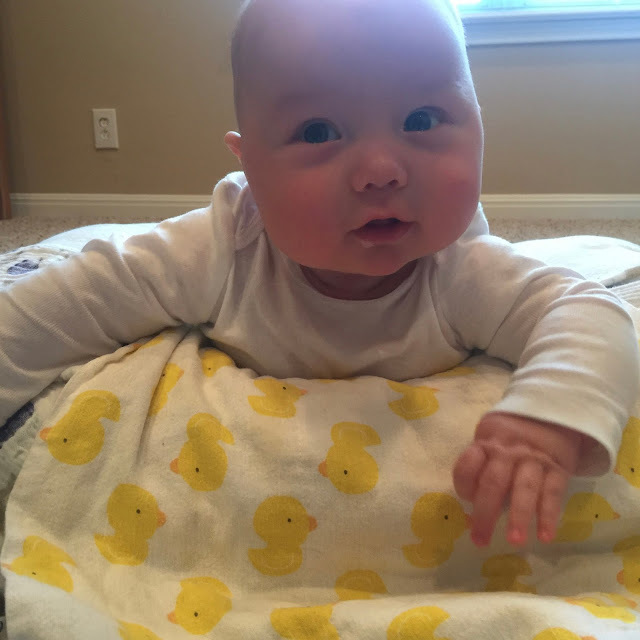 He is in the 90th percentile for weight and 75th percentile for length - he's a big, healthy kiddo! Jack is currently wearing size 3 diapers. Supposedly the size 3 Pampers Swaddlers are good until 33lbs, but I just don't think there is anyway that Jack will last that long in them. Size 3 is a pretty good fit right now, and with much more growing, I think he will need to move on to another size... the boy has a pretty big belly!! Jack eats 6 times per day (on average), and as he is growing bigger it is becoming more and more difficult to nurse him. He is quite long and squirmy and loves to kick off the side of the chair and look around the room at windows and watch whatever else is going on (light fixtures, ceiling fans... very interesting things, I know!). Basically, unless he is super hungry and focused on eating, he gets a bit distracted! I recently made a tally, and I have about 800oz of milk frozen in the freezer... that's over six gallons of breast milk, people! I don't know whether it is strange to have so much or something to be proud of, but either way, one thing is for sure: we need another freezer. Jack is now sleeping in his crib in his room for both night sleep and naps. I know you're not "technically" supposed to transition babies to their own room this early (according to the AAP, at least), but Jack had been consistently sleeping through the night for about a month and a half, and it was getting to the point where John and I were accidentally waking Jack up in the middle of the night (using the restroom, getting a drink of water, etc.). I didn't want Jack to get used to waking up in the middle of the night (and then needing to eat - and then getting used to metabolizing at that point), so I wanted to preserve his night time sleep by moving him sooner. It got to the point where we were so scared to wake Jack up in the middle of the night that we would just lay in bed uncomfortable to avoid waking him up, ha! So... basically, it was time for him to move to his own room - both he and we are now sleeping much better because of it. However, I was quite surprised at how much I missed him when he was moved to his own room and not in his bassinet right next to me. I basically stared at the monitor all night for the first 3 nights that he was in his own room! It got to the point where I was so stinkin' tired from not sleeping for 3 nights straight that I just crashed and was all like "well, God, I guess you got this one!" ha. With the transition of moving Jack to his crib, we also removed his swaddle. He is consistently rolling to his side (in fact, he is much happier sleeping on his side) and can occasionally make his way to his belly... so it was time to get rid of the swaddle. 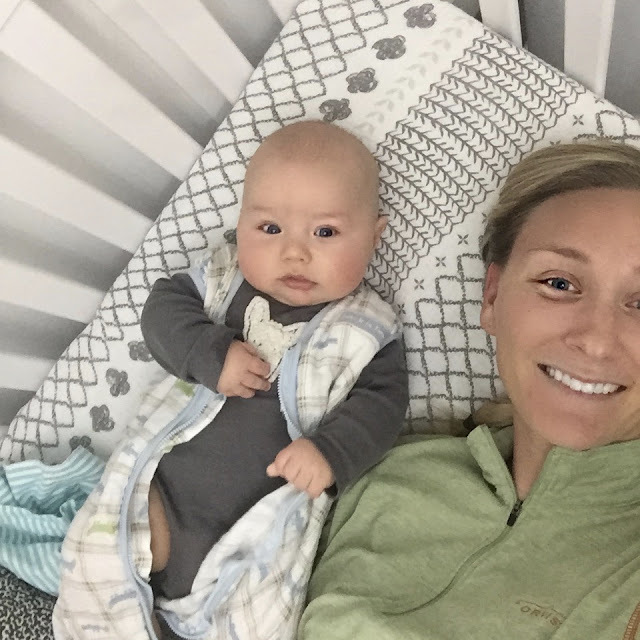 I was most concerned about his sleep transition having no swaddle (he now uses a sleep sack), but it really wasn't a huge deal - the transition of everything (his own room, from bassinet to crib, and removing swaddle) took about 3 days for him to start sleeping "normally" again. I was pretty concerned about Jack hitting the 4 month sleep regression, but I think we have made our way through it already (fingers crossed). There was one night where he woke up every 3 hours on the dot, and I thought I was going to die the next day. All day I researched sleep training methods and had totally amped myself up to be prepared to let him cry it out a bit, but when night time rolled around, he slept like an angel (and of course, I slept terribly because I was so mentally prepared for a tough night!). We have also moved Jack's bedtime from 8:30PM to 7:30PM... it's funny because he doesn't wake up any earlier in the morning despite going to bed an hour earlier. He sleeps until anywhere from 6AM-7:15AM, and I really can't complain one bit! If he wakes up closer to 6AM, I will feed him and lay him back down and he will sleep until 9AM (at which point we "start" our day), but if he wakes up closer to 7AM, then I feed him and we start our eat-play-sleep cycle at that point. Jack is currently wearing 6-9 month clothes... how is my 4 month old wearing 6-9 month clothes?! I recently put away another bin of his clothes that no longer fit him, and the whole process was a little bit sad for my momma heart. I hope that they get used again for another little boy, but what if they don't? I love my little boy so much, and I hope that he isn't the only one I'll ever have... there's no way to know, so I'm soaking up every moment I can! He also loves laying on his changing table and talking up a storm to us. For some reason he is always super chatty when he is on his changing table. He also loves sitting up (if he is laying down he will strain his neck to try and sit up) and his bouncy seat. He doesn't really "jump" in it yet, but he will push off of the ground hard to fling himself back... he thinks it's pretty funny and exciting when he does that! If there is one thing that Jack hates more than the straps of his car seat being tightened, it is being strapped in his car seat when the car is not moving... seriously - that boy has some lungs on him. It used to really annoy me when people would slow down long before reaching a red light so that they could keep cruising until it turned green, and it wasn't until now that I started considering the possibility that they too have a baby who screams at red lights! John will even stop the car with enough room in front of him to inch up when Jack starts to scream... anything we can do to save our ears! John is Jack's absolute favorite person - seriously, that little boy loves his daddy so much. All John has to do is smile at Jack and Jack will just laugh, laugh, laugh. Whenever John leaves the room that Jack is in, Jack will follow with his eyes and watch John leave... it is way sweet to watch. Also, I joined a ladies Bible study at my church that meets on Thursday nights which means that John has to put Jack to bed those evenings. At first I was a little concerned on whether or not this would work since Jack would be getting a bottle instead of nursing, but much to my delight, it has been going absolutely perfect. Jack has no issue hanging out and having John put him to bed. It is a little bit amazing knowing that this is possible because it doesn't make him dependent on me to be put to bed. John and I also enjoyed several date nights this past month... since Jack is on a pretty good bed time schedule/routine, it makes it pretty easy for other people to lay him down for the night. Sometimes he gets so tired when 7:15PM rolls around that he doesn't even want to eat and just wants to go right to bed! My favorite moments this past month have most definitely involved Jack realizing that he can make all sorts of fun noises. He realized that he can squeal, make high-pitched screams, and is starting to baby babble more - it is just about the cutest thing I've ever seen (and heard!). We've also been taking Jack to the church nursery on Sundays, and I really enjoy dropping him off and going to get him after the service and finding out that he has been perfectly happy and content. He loves it because the ladies in the nursery let him sleep on them... when he has to sleep in his lonely crib at home. ;) I can't wait until he gets older and starts coming home from Sunday school with fun crafts and Bible verses to read throughout the week! 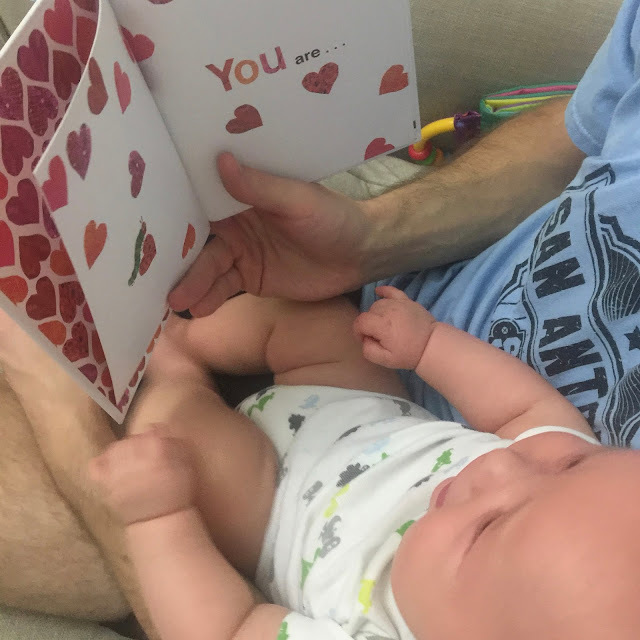 Jack and I also had fun sending out baby Valentines. Jack certainly doesn't seem to mind baby crafts... which warms his momma's DIY lovin' heart! I am so looking forward to getting to see more and more of Jack's sweet personality. I love that we are getting to know him more and more. John and I have several theories on what his personality will be like when he grows up, and it's fun to speculate... but only time will tell! I absolutely love fun jewelry... earrings, necklaces, rings... I love it all! So when Happiness Boutique asked if I wanted to pick a few pieces, it took me all of 2 seconds to respond and say "yes!" When perusing their website, I knew right away that I wanted these earrings. 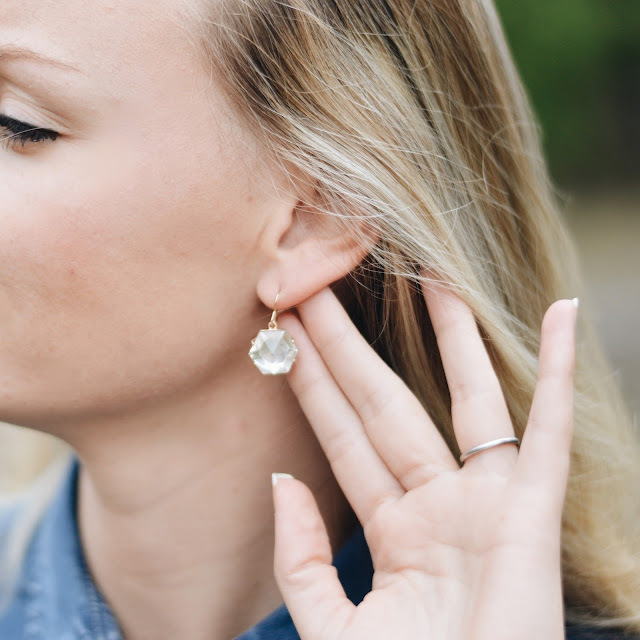 Whether it is a dress or a t-shirt, these earrings work perfectly. 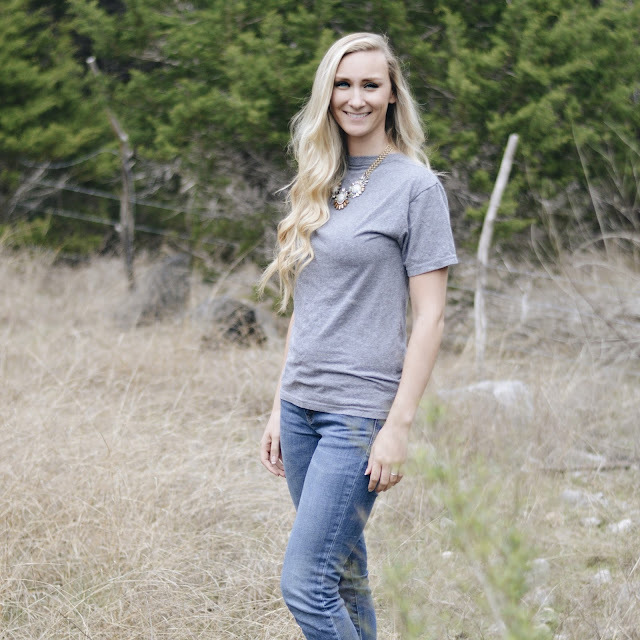 They are playful, but simple enough to wear every day. Similar to the earrings, as soon as I saw this necklace I knew I would get a ton of use out of it... and I have! With a baby in tow it seems like I am in and out of t-shirts (the sweet babe spits up a lot...), but the awesome thing about a good statement necklace is that it is so easy to dress up or down - a perfect go-to when I'm running errands around town, but also works for dinner out with John! The prices good, and the quality is great too - I've worn these earrings almost every day since I got them and they have held up perfectly! Oh yes, and there is free shipping too. :) All of their jewelry is fun and playful... so if you ask me, Happiness Boutique couldn't be a more perfect name! If you place an order by March 25th, you can get 10% off with the discount code lisalovesjohn. 10 things to do for preparing to bring home baby! Now that it has been almost 4 months since bringing Jack home, I am able to look back at all of my pregnancy nesting activities and evaluate whether or not all of the efforts were actually helpful. 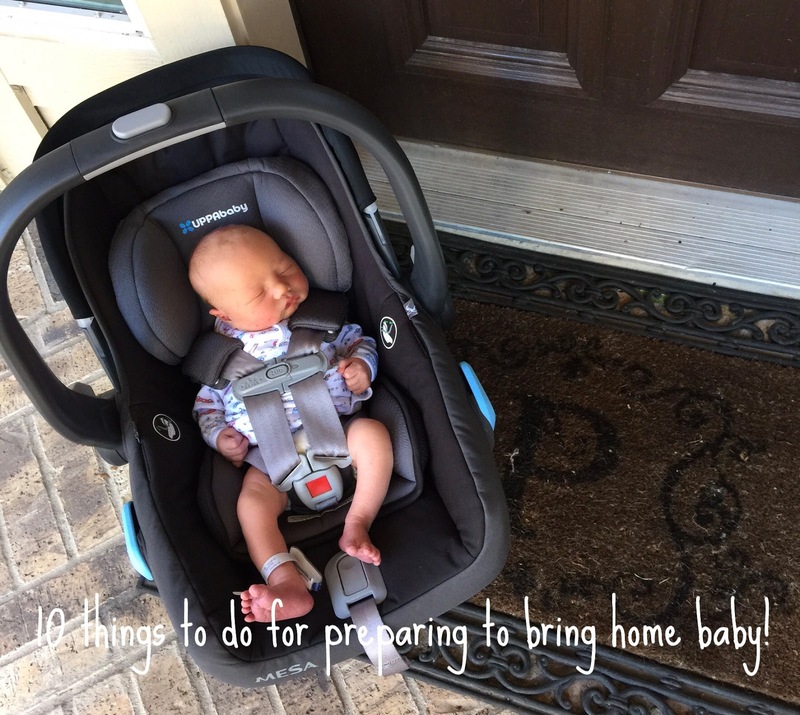 I may have gone a little overboard in the nesting and baby preparation department, but to be honest, I don't regret the effort a single bit... it made bringing home baby a little bit easier knowing I had prepared logistically! The truth is, there is so much that you can't prepare for, so tackling what you can beforehand will make things much easier. ONE | Clean house... but don't do it yourself - pay someone. Get your house deep cleaned. 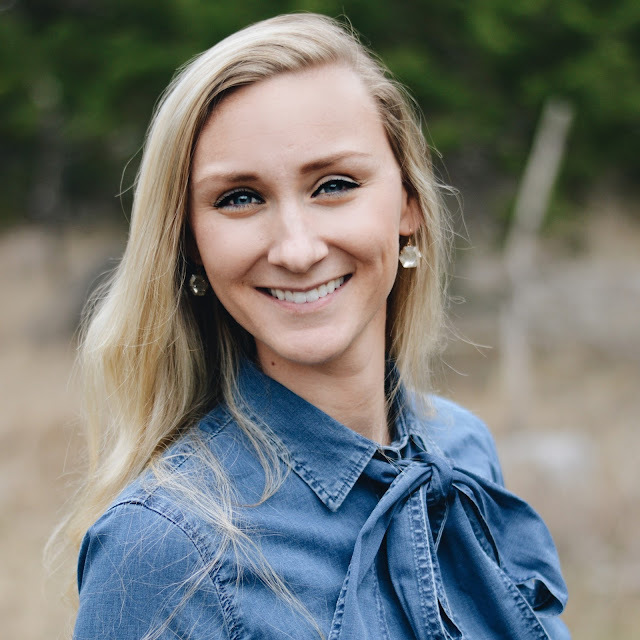 Once the baby arrives it will probably be 2-3 months before you feel up to dusting your ceiling fan, cleaning your windows, wiping your baseboards, etc. So to ensure that your house doesn't get too grimy (assuming this would bother you! ), have someone come do a deep clean of your home. This was one of the many "nesting" Groupons that I purchased... we had our carpets cleaned, interior and exterior windows washed, and our home deep cleaned (baseboards, fans, etc.). John literally asked if I had purchased stock in Groupon because I was buying so many ...and every single one was worth it! TWO | Pack your bag and put it in the trunk of your car. We all know that you need to pack a hospital bag, but don't just pack one... put it in the trunk of your car! In fact, preemptively put anything in your car that you may want at the hospital (birthing ball, pillow and blankets, nurse thank yous, etc.). By putting everything in your car beforehand, you won't be rushing out the door trying to grab everything and end up forgetting something. This ended up being very helpful for me since I was unexpectedly induced when I was at the doctor for my normal 39 week appointment. Thankfully, I had everything already with me so John wasn't left trying to figure out what we needed on his way to the hospital to meet me. THREE | Install the car seat. Install the base and carseat in your car... in fact, if you have more than one base (one for your car and one for your husband's car), install the bases in both vehicles because you never know where you may be when it is time to go to the hospital. Again, having the carseat base and seat already installed in my car ended up being so helpful considering I had an unplanned induction. And hey! It's fun and exciting to drive around with a carseat when you're waiting for your little one to arrive. FOUR | Make preparations for other kiddos or pets. John and I don't have family in Texas, and we needed to come up with a game plan to take care of our dogs when it was time to go to the hospital. To prepare for this, I portioned out food for each dog into little baggies and had detailed feeding and care instructions. That way when it was time for baby's arrival, we could bring them to be boarded and drop them off without having to go into how to care for them. FIVE | Have a to-do and to-grab list for when you're running out the door. Even if you have your hospital bag packed and in the car, there are probably a few things that you will need to grab on your way out the door (wallet, toiletries, etc.). Make a list of these items (and put the list on your door!) so you don't forget anything while running around heading to the hospital. SIX | Make (or buy) freezer meals. Having a few meals in the freezer will come in handy once the baby arrives and you're not just too tired to cook, but too tired to even consider making a grocery list and going to the store. If you don't feel like making a freezing dinners, then that is totally fine - just go and buy some! Both Trader Joe's and Costco have some great frozen meal options. SEVEN | Purchase postpartum supplies. The truth is, you can only steal so much from the hospital before starting to look like a serious cheapo (and trust me, I really pushed the limit on this one!). Before baby arrives purchase the many postpartum supplies that you anticipate needing before you come home from the hospital. Pads, Colace, nursing supplies, etc. EIGHT | Interview and meet with your pediatrician. You don't want to be calling around trying to find a pediatrician that is accepting new patients and takes your insurance after the baby is already born... so make sure to do this before! Also, at my hospital if you don't declare your pediatrician, then whatever doctor is on call will see your child. There is nothing wrong with this, but I was looking to have my pediatrician declared so that Jack saw the same doctor when he was in the hospital, for his 2-3 day visit, and all future appointments. NINE | Have your logistical checklist ready. Once you have a baby there are many administrative things you'll have to remember to do... if you work you'll need to activate your short term disability claim, notify your work to start FMLA, and add your baby to your insurance policy. Gather all of this paperwork beforehand and have it ready in a folder so that you can make a few calls and be done with it - there's nothing you want less than to be digging through paperwork trying to find all of the needed information when you've got a hungry baby waiting for you!